Magnet Schultz Ltd has provided an electro-permanent magnet to the National Oceanography Centre for use in its Autosub6000. 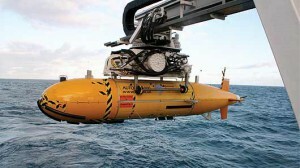 The Autosub Autonomous Underwater Vehicle uses purpose-designed Magnet Schultz technology to release abort weights in the event of a fault. The sub has now completed successful deep sea surveys to depths up to 4600m. As an underwater, unmanned vessel, the Autosub uses an electromagnet to hold a counter-weight beneath it. This electromagnet releases at the end of the Autosub’s voyage so the vessel rises to the surface. An ARGOS beacon then emits a signal from the Autosub to enable a support ship to find and collect it, along with the data and samples collected. “To work reliably we needed an energise-to-release electromagnet. As most electromagnets work the other way around, generating a magnetic field and using it in reverse uses a substantial amount of power – not ideal for the Autosub’s limited power budget! As a heavy duty holding magnet, the GMPX 050 X00 D02 unit’s robust construction and finish make it ideal for the corrosive environment of seawater. In addition, since the Autosub was tested to increasingly greater depths, the magnet was required to withstand massive pressures, so construction was extremely important. This was reflected in the final design. Magnet Schultz’s power-to-release electromagnet does not use any battery energy when it’s not being used. In case of a fault, for example, if the mission has taken too long or the vehicle has gone beyond its programmed depth the electromagnet is pulsed from the battery pack with a capacitive energy store as back up in case the battery itself has failed. The device typically releases a 10kg steel weight via a release mechanism developed at the NOC. With that counter-weight mass jettisoned, the natural buoyancy of the sub returns it to the surface for recovery by its support vessel.